Unfortunately, there are always cases of animal cruelty in the news, yet the tale of Finn – a police dog who was stabbed in the head and chest – makes you realise just how precious our canine companions are. PC Dave Wardell and German shepherd Finn were attacked by a boy – who cannot be named because of his age – in Stevenage in October 2016. Finn suffered life-threatening injuries after being stabbed multiple times with a hunting knife. The 16-year-old male, from London, was found guilty of causing PC Wardell actual bodily harm and criminal damage in relation to Finn at a trial in May last year. He was sentenced at Bromley Magistrates and given eight months’ detention for his disgusting attack. PC Wardell and Finn were attacked by the boy in the early hours in the Hertfordshire town while responding to a report of a robbery. Poor pup Finn was stabbed with a 30cm (12in) hunting knife in the head and chest and underwent four hours of emergency surgery, report the BBC. I begged the vet to save my boy. The officer received stab wounds to his hand but luckily was not badly hurt. The teenage male, from Lewisham, south-east London, was arrested the following day, admitting to possessing an imitation firearm and the knife used in the attack – although he denied attacking them. 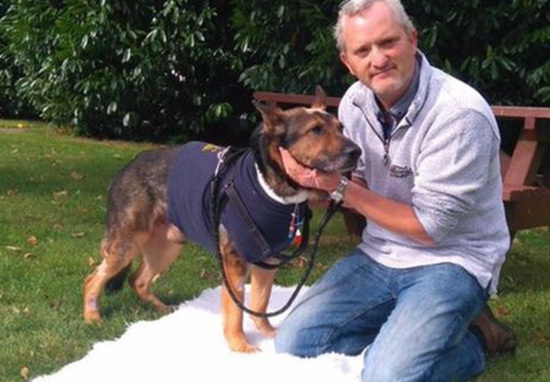 PC Dave Wardell and Finn are reunited. The unnamed boy appeared for sentencing at Bromley Magistrates’ Court in south London. He was given an eight-month term for ABH against PC Wardell and eight months for possession of the weapons, to run concurrently, spending half of his sentence in a young offender institution and the other half on supervision or probation, state the Crown Prosecution Service. Without Finn there that night I would not have been going home to my family, of that I have no doubt. Luckily for Finn, he recovered from his injuries and was able to return to work, but he retired from active duty at the end of March last year. At the end of last year, it was reported Sir Oliver Heald, a former solicitor general, was to call for legislation to cover those who injure ‘service animals’, including guide dogs and animals assisting police and military officers, reports The Telegraph. The bill, which was backed by four former ministers, was aimed at filling a ‘gap’ in the law. 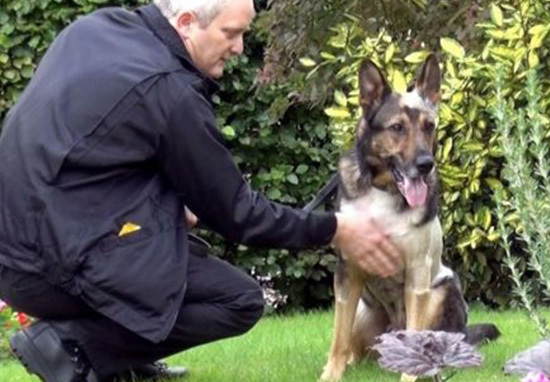 PC Dave Wardell was a constituent of Sir Oliver’s and the former solicitor general said the case highlighted how there was no ‘suitable or appropriate’ specific legislation under which an attack on a service dog could be prosecuted. Whatever Finn’s up to now – whether it’s chasing a ball or going for leisurely walks – I hope he’s enjoying his well-deserved retirement!